Technically these were virtual baby shower cupcakes as the Irish Parenting Bloggers Group celebrated the arrival of a new baby to their midst, and in great anticipation of another who was baking away. See what I did there? Sure it is an Irish food & parenting blog after all! I couldn’t come to the party with one arm hanging longer than the other could I? Whenever you get the chance, turn the music up loud. Grab the nearest child and dance with them, feel the beat of the music course through their bodies and yours. Sing at the top of your lungs and relish the moment. Teach your children to have the same approach to life. When you get a chance and the kids are in bed, quiet and you are on your own with your significant other, take the opportunity to dance with them. Turn on your favourite tune, be it first dance song and just dance. Some things don’t need words to express. Dance and be part of the music. When you’re having a good day; the baby is giggling gorgeous belly chuckles that peal like bells, the toddler is playing away happily and you are enjoying a cup of tea (warm from start to finish), breathe it in and relish it just like that delicious cup of tea. When it all seems awful, and the baby won’t stop screaming and your eyes are hanging out the back of your head with the tiredness. It will pass, each breath will get you there. Nourish your body with good food, often and don’t forget that breastfeeding does mental things with your hunger levels. Remember also to drink a lot of water! Feed your mind, keep it active, keep in touch with friends, family, read as much as you can and see can you find even a little bit of time to yourself. It will stand to you. Sustain your relationship with your other half, as it can become a little neglected with all the things pulling you each in every direction. If you can afford it, set some money aside and find a babysitter, even if it’s just to get out for a walk every now and again together. Here’s the recipe for the Baby Shower Cupcakes. It makes 12 large cupcakes and yes you can freeze them for up to 2 months in advance. Preheat your (fan) oven to 180 degrees Celcius and put liners into a cupcake tray/tin. Put the dry ingredients (flour, sugar, malted milk powder and baking powder). into a large bowl and stir. Put all the wet ingredients (butter, eggs, milk and vanilla extract) into a large jug and stir well so that they are mixed together. Pour the wet ingredients into the dry ingredients and beat until there are no lumps. Divide the mixture between the cupcake cases, making sure to fill only to the 3/4 mark as otherwise they will spill over. Bake in the preheated oven for approximately 20 minutes. The malted milk powder will make them turn quite golden on top and crunchy. Test the centre with a cocktail stick after the 20 minutes. If the stick comes out clean then they are baked. Otherwise bake for a further 5 minutes. 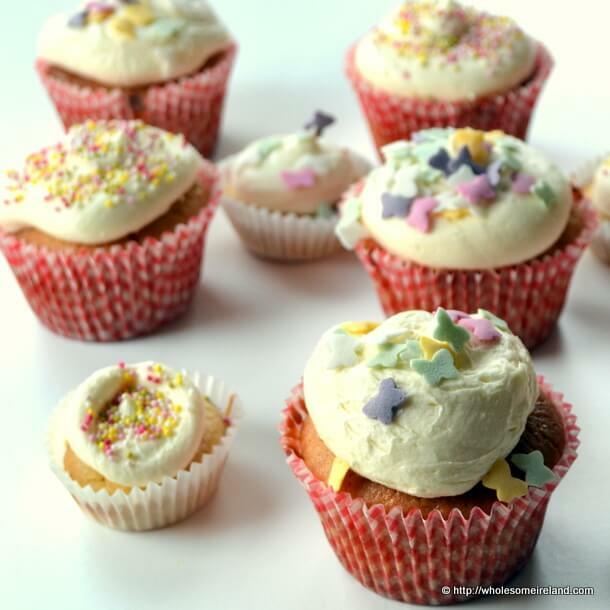 These cupcakes taste delicious on their own but equally they can be frosted/iced with a whipped combination of 100g softened butter, 300g royal icing and a teaspoon of vanilla extract. Here I’ve decorated them with some fun sprinkles and made a couple extra for the small people at the party. What a lovely post. Beautiful from head to toe. They look fantastic. Wish I could grab one off the screen. Thanks Caroline, at least one of our lucky mama’s will get to enjoy them! I echo what Caroline said 🙂 Thank goodness someone brought some tasty treats to the party!! Thank you Emily. I’m glad that at least one of our lucky mama’s was able to enjoy them!